Radiography and fluoroscopy are essential tools for doctors in clinical analysis and medical or surgical intervention. In orthopedic practice, this includes the use of fluoroscopy when guiding instrumentation during the positioning of implants, screws, pins and plates (1). However, the risks that come from exposure to the inherent radiation are well known, placing limitations on training opportunities wherein the association between less experience and higher use of radiography has been well established. Fundamental Surgery offers a new approach to overcome this challenge – virtual surgical environments incorporating multi-view fluoroscopy, where you can practice intraoperative imaging usage with no risk of radiation. 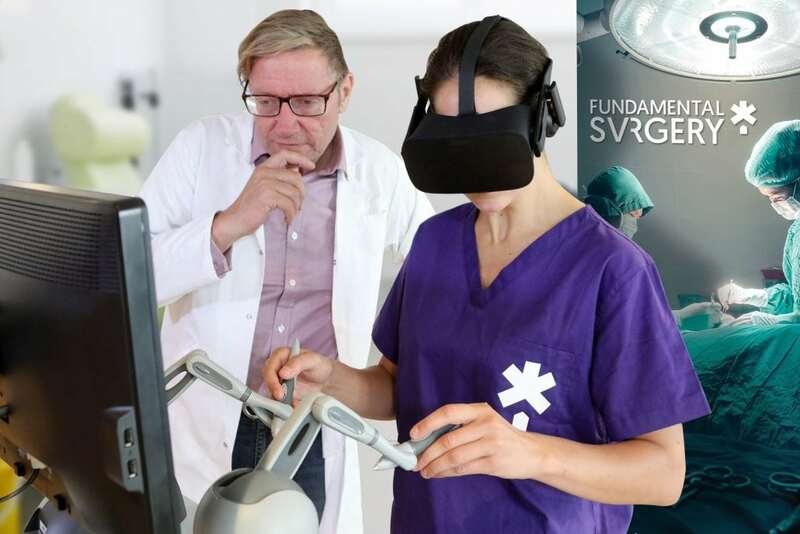 Fundamental Surgery uniquely combines the power of surgical touch experiences with VR simulation, and this generates maximum immersion. So it really feels like you are doing surgery. Much like other professions, medical practice is associated with occupational hazards. Surgeons specifically, carry out work on a daily basis that allows them to be subjected to both physical and mental occupational risks. The human cost of poor occupational safety and health practices is estimated at 3.94 per cent of global Gross Domestic Product each year (2). The environments that surgeons work in undeniably offer ample opportunity for them to injury themselves. Whether that be with a sharp instrument, exposure to diseases, or more specifically the radiation that comes from using an x-ray on a patient. X-rays are used to produce visual images of broken bones, more subtle injuries to the body such as twists, cracks or fractures, and also keep an eye on implants from previous surgery to ensure they remain healthy and in place. Orthopedic surgery and trauma surgery are two key areas where x-rays are used but the risk of radiation is well documented (3). Fundamental Surgery gives surgeons the opportunity to use the intraoperative benefits and practice of an x-ray in a safe, accurate surgical environment that they may learn the skills and techniques by repeated, limitless repetition. The simulation can offer multiple planes (sagittal, coronal/frontal etc) that the training surgeon can understand and learn from different positions, much like in the real surgery. The difference being traditionally this learning has been both high risk, and limited. The link between simulation and improved surgical performance is well established (5) and the implementation of training programs for med-tech developments is increasing in both speed and frequency. A safe, repeatable environment for training has become critical. Something that Fundamental surgery is leading on. Cook DA, Hatala R, Brydges R, Zendejas B, Szostek JH, Wang AT, Erwin PJ, Hamstra SJ.JAMA. 2011 Sep 7;306(9):978-88. doi: 10.1001/jama.2011.1234. Review.